Dr. Craig Christiansen is grateful to have had the opportunity to grow up in Utah, attend college locally and then get accepted to dental school in 1990 to the University of Nebraska College of Dentistry. He was a "Cornhusker" during the era when the University of Nebraska won three national championships in college football although he will still cheer for BYU or Utah State if they play against Nebraska. He is still a Cornhusker fan, but he bleeds blue. After graduating and becoming a dentist in 1995, Dr. Christiansen moved with his wife, Karine, and young children to Pleasant Grove and lived there for 5 years. The north part of Pleasant Grove is where his maternal ancestors have owned property from the late 1800’s until today. He and Karine and their four children moved to Lindon and have lived there since the "turn of the century" in 2000. Dr. Christiansen enjoys helping people to have a healthier, stronger, and more attractive smile and he spends a lot of time and energy being very good at being a dentist. 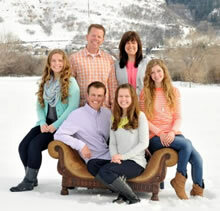 He opened his own practice, "Christiansen Dental" in Orem in 1995 directly after graduating and moving to Utah. He is very interested in all aspects of dentistry and has continued with his studies over the years to remain on the cutting edge of dental technology and skill. His focus areas at this point in his career are primarily in cosmetic dentistry, implant tooth replacement, orthodontics, treatment of TMJ problems, and ceramic tooth restoration. Dr. Christiansen made a decision to practice completely metal free in 1998 and has not used any metal in his restorative dentistry since that time. In this day and age, the dental materials and procedures are so good that it is a privilege and honor to be able to be a dentist and really improve people’s lives by improving their smile and the function of their teeth. He is so thankful that dentistry is not just patching holes and eliminating toothaches any more like days gone by. A quote from Dr. Christiansen: "What I am most proud of professionally are the friendships that I have made and the service that I have been able to give to my wonderful patients. I am very blessed because I have a few thousand patients who have become more than just my patients—they are my friends--and I get to help them and serve them every day at work. I love to be able to make a living and provide for my family while helping and serving wonderful people!" Dr. Trevor Lindgren earned his Doctorate of Dental Surgery degree from Virginia Commonwealth University School of Dentistry in the top ten of his class after graduating from Brigham Young University. Dr. Lindgren also did a general practice residency at the Veterans Hospital in Salt Lake City where he learned more about implant placement, dentures, sedation, root canals, and other valuable dental skills. Dr. Lindgren grew up in Sandy & Draper Utah, has been married for more than ten years to his wife Alissa, and they have two young children. Dr. Lindgren enjoys hiking, biking, skiing, camping, running, rock climbing, watching documentaries and movies, playing with his kids, bonsai trees and gardening, working on construction projects around his house and going on dates with his wife. Dr. Lindgren is a scout leader and he earned his Eagle Scout as a youth. 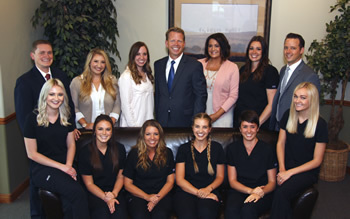 Dr. Lindgren and his family are active in their church and community and is happy to be here in Orem with Dr. Christiansen to provide you with high quality dental care. Dr. Spencer Hill grew up not to far away in Lindon, Utah. He played soccer and served in Student Government at Pleasant Grove High School. He graduated with a Bachelor of Science degree in Biology at Brigham Young University. In Provo, he met the girl of his dreams and they were married in Portland, Oregon. They moved to Arizona to attend Midwestern University College of Dental Medicine. After graduating from dental school, his family moved to Augusta, Georgia where he would serve as a Captain and dentist in the United States Army at Fort Gordon. Dr. Hill has since moved back to Utah County and is excited for what the next chapter in his life brings. 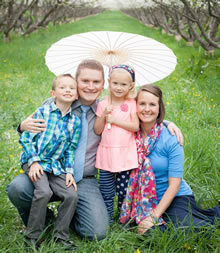 Dr. Spencer Hill enjoys spending time with his wife Kelsey, and two children. He can be found working around the house and yard. Dr. Hill actively volunteers his time with young men in his community. He likes watching movies, playing games, wakeboarding, snowboarding, and playing sports. Dr. Hill has a passion for dentistry and is excited be with the Christiansen Dental team to work hard to provide quality dentistry for his patients. We at Christiansen Dental have a combined 59 years of experience in providing high quality dental service to our patients in Orem, UT and surrounding areas. Our experienced staff has been in dentistry for a combined 136 years! Our Office Manager is Jaymee, our Scheduling Coordinators are Shelly and Myka, Ashley and Chelsey are our hygienists, and our Dental Assistants are Becky, Brittany, Katie, Kelsey, Sierra, and Morgan. We love to help people to have beautiful, healthy, and comfortable smiles. We are constantly improving and are dedicated to become the best source of dental care for families in Utah County and beyond.